ReCrochetions: Day 19: Just Say No to Single Crochet! Day 19: Just Say No to Single Crochet! Firstly, in all honesty, I don't personally enjoy making solid fabrics of single crochet. Although I don't generally struggle with tension, I often find that after a few rows of single crochet my stitches get tighter and tighter. So a solid consistent fabric of single crochet is rather difficult for me, even when I go up a hook size and concentrate on keeping my stitches loose. Also, I got rather burnt out on single crochets many many years ago after my first full-size afghan project. After completing a giant afghan of row upon row of single crochet, with occasional dropped down stitches, I have always preferred the quick results of taller half double and double crochets. 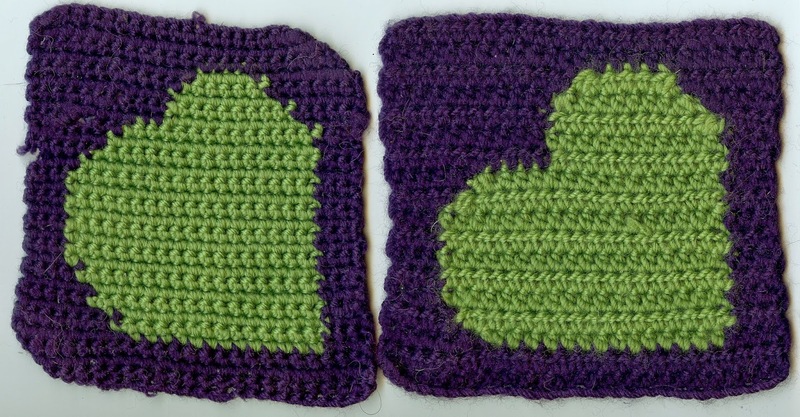 Heart swatches in Single Crochet and Half Double for "I Love Baby" Blanket. Just couldn't create as smooth lines in single crochet and the edges curl up. My first designs that I developed the technique on were worked in Double Crochet, adapting the stitches so they work much like a single crochet grid. With half-color double crochets (introduced in my book) one row of doubles can equal 2 rows of singles. And with the taller stitches you can use increases and decreases to create smoother lines and curves. My original "Four Square" block was worked in single crochet. But as I worked with the technique more, I discovered that single crochets just do not work as well as half doubles and double crochets. When you work into the top of a single crochet, you are working OVER the top loops of the stitch. Since there are only 2 loops in a single, you only have 1 little loop of color left when you work the next row. But with a half double crochet, that extra yarn over leaves you 2 loops of the color, giving a more distinct stitch of color where you want it. Hi, visiting you via Sulia. Very interesting! I must admit it never occurred to me to use half doubles and double crochet stitches for colorwork. Great idea! Wish you the best with your blog.